The American came from two sets to one down to beat the world number one, reaching his first Grand Slam semifinal. 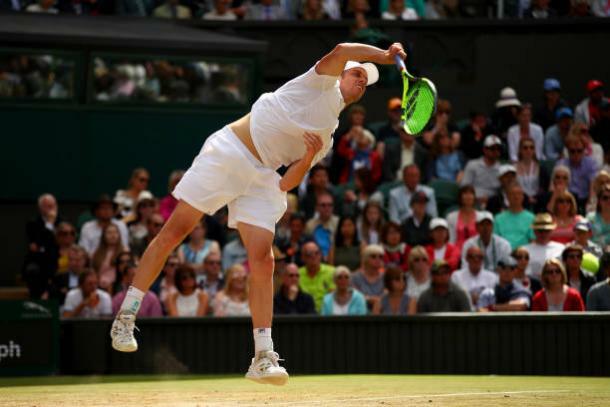 Sam Querrey stunned the Centre Court crowd at Wimbledon on Wednesday, battling past Andy Murray from two sets to one down to reach his first Grand Slam semifinal at his 42nd major tournament. 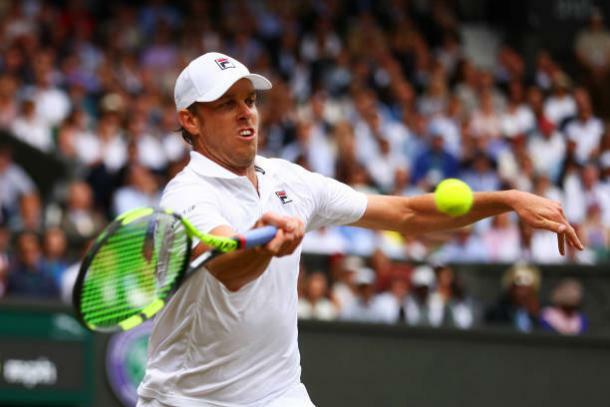 Querrey, the 24th seed, beat the then world number one Novak Djokovic at the All England Club last year, and this year played a simply superb match to upset the defending champion 3-6, 6-4, 6-7(4), 6-1, 6-1 in two hours and 42 minutes. There was no doubt that Murray, who was looking to defend his Wimbledon title after falling at this stage during his first defence in 2014, was struggling in the final two sets, with the American simply bullying the first seed around the court and breaking five times in the final two sets. The American will face seventh seed Marin Cilic in the last four. Murray had far more experience at this stage of a Grand Slam tournament, and that showed early on as the Brit got off to a far better start. The defending champion held to love in the opening game of the quarterfinal and then broke the evidently nervous American to put himself in charge of the first set. 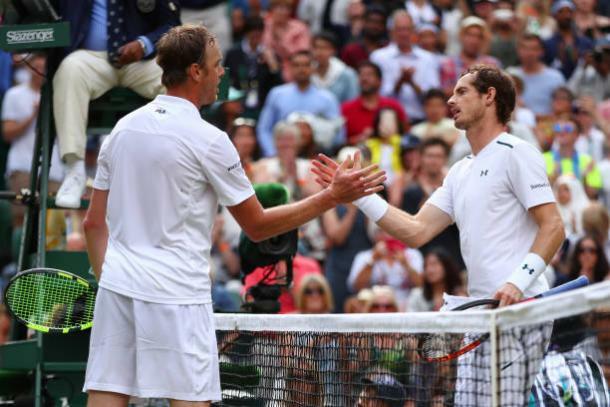 Querrey found himself 3-0 down as Murray consolidated the break, and the 24th seed managed to settle a few nerves as he held to get on the board. 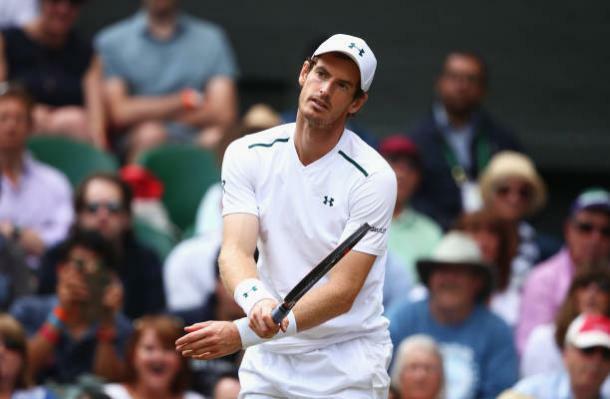 Querrey was solid on his own serve after that early wobble, but Murray remained completely untroubled when serving himself, and the world number one faced little trouble as he held once again to take the first set in just 28 minutes. The opening stages of the second set virtually continued in the pattern that the end stages of the first, with both men looking fairly comfortable on serve as both Murray and Querrey who eased into the second set. However, Murray seemed to be the far more comfortable of the two, and the Brit converted a break point to take a 4-3 lead in the second set. However, for the first time, there was a slight little wobble by Murray, and the 24th seed took advantage as he immediately broke back to level things up. Seemingly energized by that break, Querrey held to love to put the pressure back on the top seed, and the pressure showed as superb backhand saw the American break and take the second set. Querrey undoubtedly had the momentum heading into the third set, though some sloppy tennis saw Murray break to start, and the Brit consolidated his advantage to effectively crush any advantage that Querrey had heading into the third set. Just as in the first set, Querrey regained his composure after his early wobble, though it seemed that he would be unable to even things up this time. However, despite looking so comfortable throughout the majority of the set, Murray again wobbled and failed to serve iit out, though the Brit regained his composure to force a tiebreak after the 24th seed had himself held serve. Querrey played a poor tiebreak, falling down 1-6, and though the American saved two set points, Murray proved too strong as he prevailed 7-4. Despite finding himself two sets to one down against the world number one, Querrey was certainly not out of this. With Murray surprisingly losing some of his intensity, the American broke for a 2-1 lead and, after consolidating, broke for a second time as he continued to strike the ball beautifully, as he had done throughout most the match. With Querrey holding, Murray found himself 5-1 down and had seemingly lost all the fight that he had shown in the first three sets. The Brit managed to save one set point, though could not save a second as the 24th seed broke for the third time in a row to take the match to a decider. After such a strong fourth set, Querrey would have been supremely confident heading into a decider, and that undoubtedly showed. With Murray still struggling, the American broke in the Brit’s opening service of the fifth set and consolidated to put himself just three games away from the last four. Murray determined to defend the title he won last year, got himself on the board as he pulled through a tough hold, though the American responded with a love hold. With the pressure on for both men, it was Querrey who handled the occasion better, playing a superb point to break for the second time. The American stayed calm, converting his second match point for one of the biggest wins of his life.